Why did we want this game? T – I heard some great reviews, especially through the Dice Tower network and it is always good to have smaller games especially as our shelf’s are groaning under the weight of games. M – I was really wanting a 4X type of game but I wanted something that was easy to transport e.g. smaller box ( looking at you Rune Wars ) and didn’t take 9 hours ( *cough* Twilight Imperium *cough*). Why did we keep this game? T – Really easy to learn, simple rules pretty much explained on the action card so you don’t have to keep referencing the rule book. There is no downtime in Tiny Epic Kingdoms, every player does something with each action. So there is strategy in choosing actions to stuff others up! I hate going first as I am really undecided. I also like how the different factions match their ‘stereotype’, so the Half-lings want peace and quiet, the Dwarves have a good bonus for building, the Elves for magic. M – Everything is explained clearly in the small rulebook and the race powers on the cards are easy to understand. 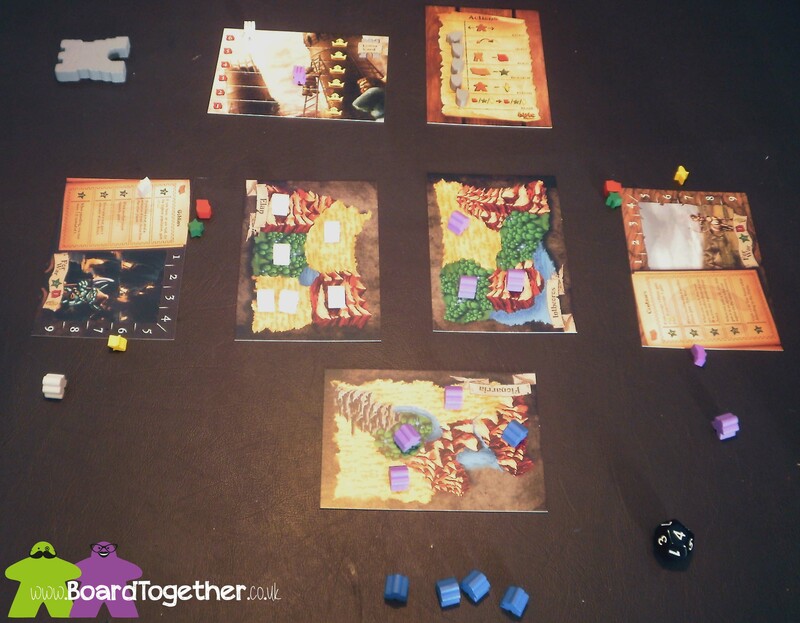 We found ourselves referencing the rulebook only twice when we started playing, once to get our head around battles and the other to clarify something about expanding our Meeples. Any handy techniques/tips we picked up? 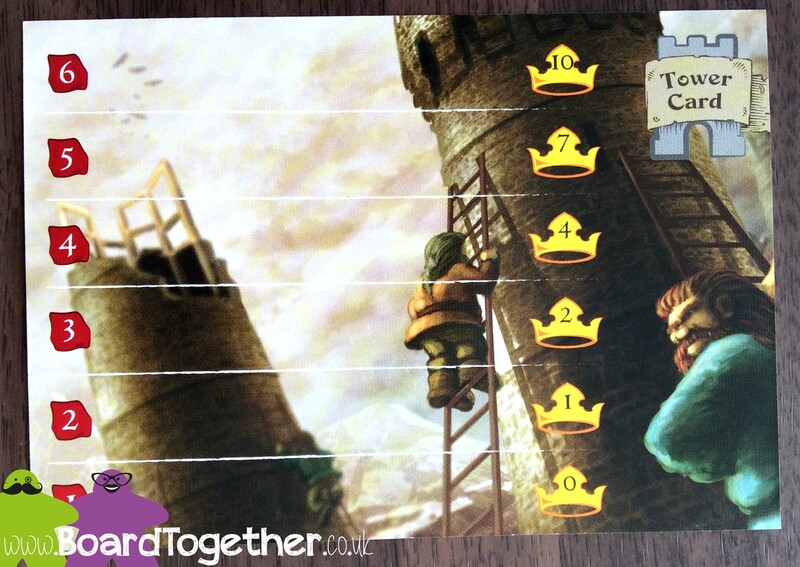 T – The game plays well as two player, but you sort of stick to your own kingdom and do your own thing. It is better with more players, the Quest action is used more and the backstabbing to gain land can be fun. M – Resources are key whether you want to build your tower, expand your Meeples, and gain Magic levels so expanding into other areas is key to getting victory points. This can bring quite a bit of conflict to the game as you position yourself to get extra resources in other players land cards. T – Reasonably simple, but great artwork for the different factions. The Half-ling is adorable and the Goblin looks wicked and cheeky at the same time. I thought it was a nice touch putting a picture inside the lid. M – The artwork is very nice and fit the theme well. 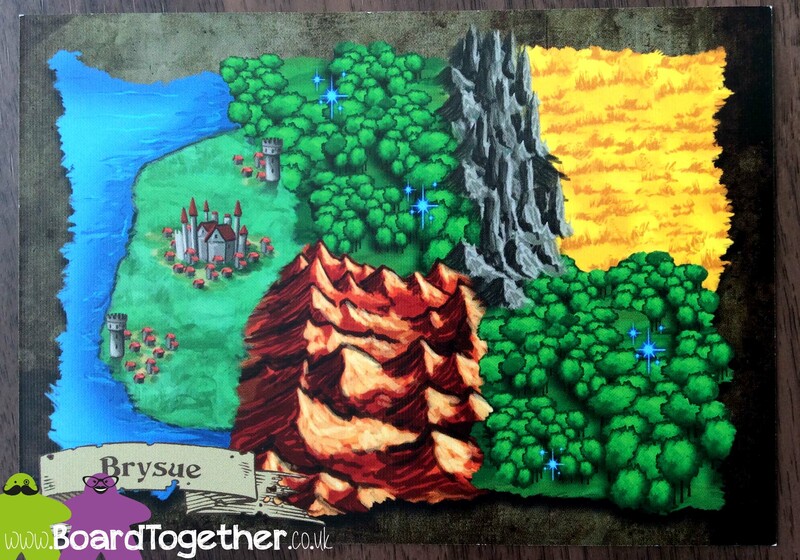 The land cards make it easy to distinguish between the different land types. The Box art is great and so are the race images on the cards. 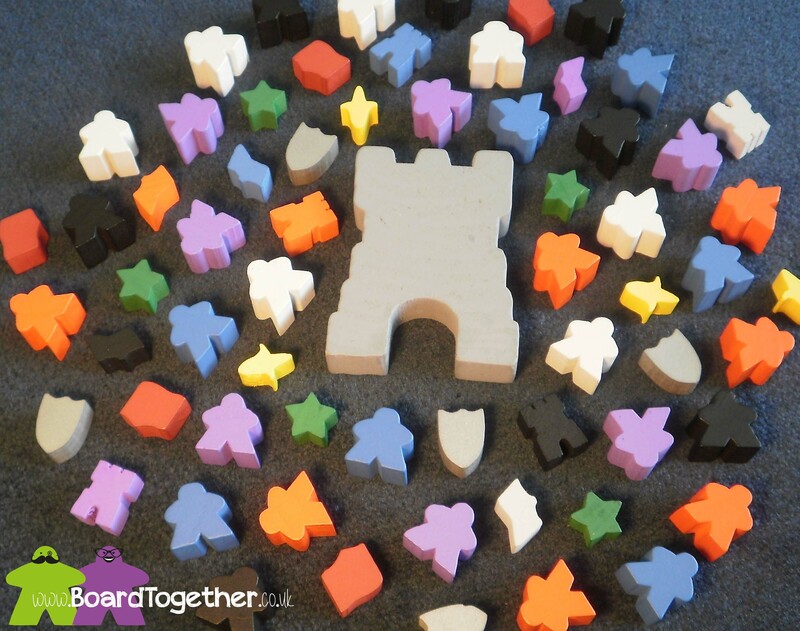 T – Wooden Meeples and other tokens, all standard but nicely done. Some look a little strange, the corn looks like a banana! M – I would of liked thicker card components as they’re made of a thin card stock that feel like they won’t put up with a lot of play. The Meeples are the standard painted wooden type so are perfect for the job. The Ore token doesn’t look like ore and the food looks like a banana but should actually be corn. How it feels to win or lose? M – Epic Kingdoms is a good game as you can easily calculate how you are doing in the game and how to prevent others from finishing the game early as they are ahead in points. It’s a fun game that’s easy to learn but has hidden depths. T – This game is great for the price. With lots of different factions you can learn to be the best with one or mix it up for more replay value. I have only really played as the Valkyries and love them. 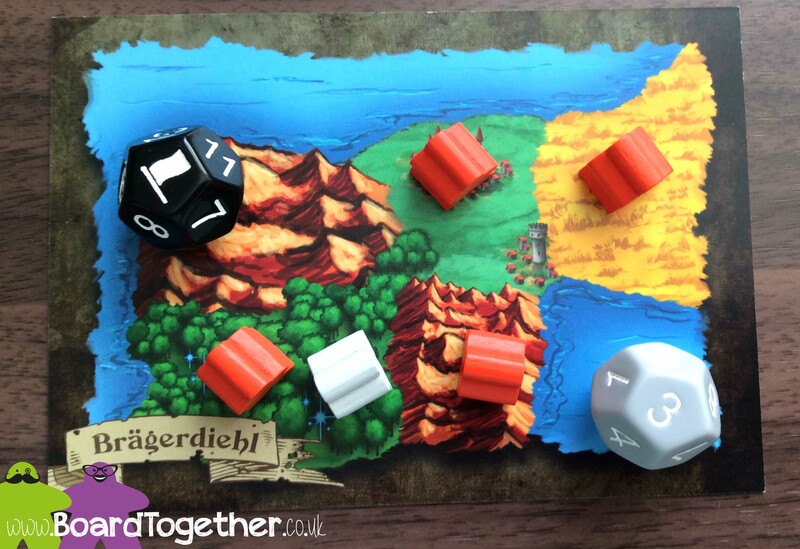 Seasoned gamers will like it for a quick filler, but it can also be used as a gateway game for those just starting but wanting to know more about the board game world. M – Small box with a lot of game. Great re-playability and looks fantastic. This I feel is a must for anyone who like the 4X type of games. 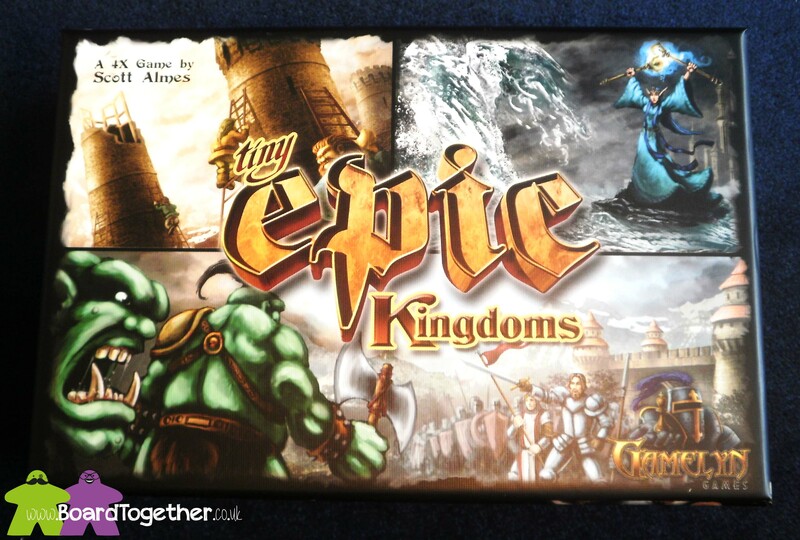 Tiny Epic Kingdoms is a 4X game ( eXplore, eXpand, eXploit, and eXterminate, technically it’s a 4E game but the X was probably cooler) from Gamelyn Games, originally Kickstarted. Each player has the option to do the same action as the current player or they can collect resources from their land cards. Then that action has a token placed on it to mark it has being used and cannot be played again until all the action tokens have been placed on the action card. Play then moves onto the next player to choose a different action. There are 5 action tokens and once they have all been placed on the action board the next player removes them all and can choose any action. The game ends when a player has achieved any of the following. Points from occupying capital cities. Each player has a card containing different land areas which when populated with a player’s Meeple generate a resource. Water is impassable to your Meeples. Each player has a seven Meeples which can be brought into play by spending food. The player starts with two and then spends as many food as there are on the board +1. so for your third Meeple it will cost 3 food. These Meeples can be moved around the board taking either an explore or quest action. Explore allows you to move one Meeple from an area on you land to an adjacent area. The quest action allows you to move a Meeple onto another players board. If the area is already occupied a war breaks out, more about that in Exterminate. Each races have a special powers that the player can spend Magic use their abilities into the game. There’s 5 levels of abilities for each race. 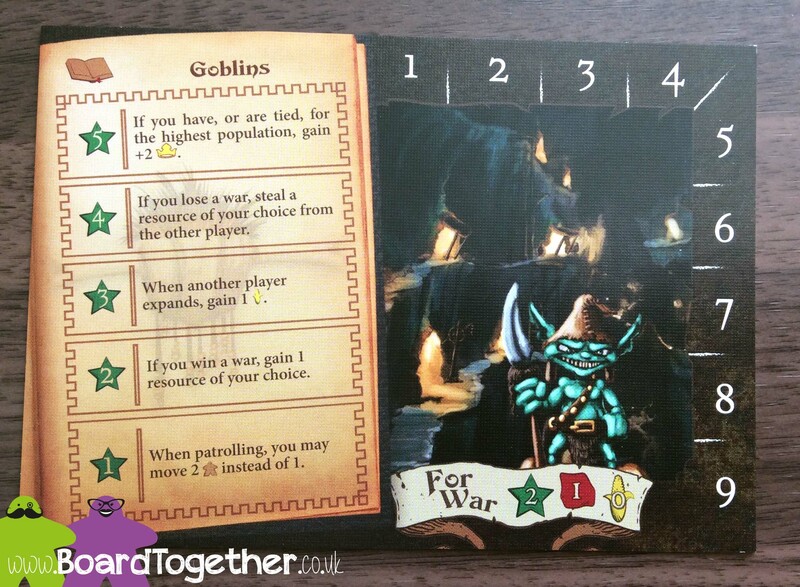 The Goblins, for example, at their first magic level can move 2 Meeples during a Move action. When the player gets to level 5 the races have abilities to gain more victory points. Goblins get extra points for having more Meeples on the board at the end of the game. The players can also spend Ore to build levels on their tower. Each level built on the tower awards the player more Victory Points at the end of the game. When a player moves their Meeple into an area that already contains another players Meeple a war breaks out. Players then have the option using a hidden dice to spend resources to kill the other player or surrender. Once all the resources have been calculated the player spending the most resources wins and the other players Meeple is removed from the board. If both players surrender an alliance is made and both players share the resources on the space. However if the players have another war somewhere else the alliance is broken off and war breaks out again in this old area.